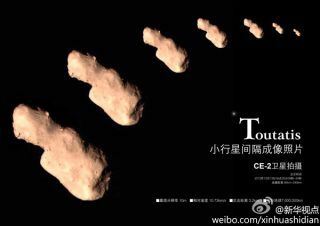 China's Chang'e-2 probe took multiple images of the asteroid Toutatis during its Dec. 13, 2012, flyby. A Chinese repurposed lunar orbiter, Chang'e-2, has flown by asteroid Toutatis, Chinese space officials announced. Chang'e-2 was launched on Oct. 1, 2010, the second moon probe launched by China as part of a three-phase lunar exploration effort. The spacecraft's main mission was to scout for potential landing sites for China's first moon lander, the Chang'e-3 spacecraft, which is being readied for launch next year. In mid-April of this year, Chang'e-2 departed its L2 position and headed for a rendezvous with asteroid 4179 Toutatis. According to China's Xinhua state news service, Chang'e-2 successfully conducted a maneuver in which it flew by the asteroid Toutatis. The flyby took place on Dec. 13 and was announced by the State Administration of Science, Technology and Industry for National Defense (SASTIND). Chang'e-2 reportedly came as close as 2 miles (3.2 kilometers) from Toutatis and took pictures of the asteroid. "The success of the extended missions also embodies that China now possesses spacecraft capable of interplanetary flight," said Wu Weiren, chief designer of China's lunar probe program, according to the Xinhua story. "I have heard they have accomplished this … it would be a great accomplishment and demonstration of Chinese space navigational and operational capability," said Mark Sykes, director of the Planetary Science Institute in Tucson, Ariz.
"I will be very interested in seeing how any direct imagery of Toutatis compares with the radar imaging models — this would be a significant contribution to our science," Sykes told SPACE.com. Toutatis was also observed by planetary radar specialists at NASA's Jet Propulsion Laboratory in Pasadena, Calif., snagging a sequence of images of the space rock as it whisked by Earth Dec. 12. The observing campaign of Toutatis was carried out at the Goldstone facility in California. 4179 Toutatis was discovered by C. Pollas in Caussols, France in January of 1989. Toutatis has been making close approaches to Earth at four-year intervals since its discovery, and as a result, it was studied extensively with radar in 1992, 1996, 2000, 2004, and 2008, and also at a variety of optical and infrared wavelengths in 1992 to 1993. Toutatis is an irregular and very elongated object. It's also a very slow rotator characterized by 5.4-day rotation about the long axis. A number of radar images were taken using the Goldstone radio dish. Toutatis approached within 0.0463 Earth-sun distances to our planet (18 lunar distances) on Dec. 12. The next opportunity for radar imaging of Toutatis will occur in late 2016 and early 2017. The next time Toutatis will approach at least this close to Earth is in November of 2069.